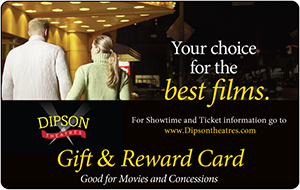 Dipson Gift Card's now available in denominations of 25,50,75,100,150,200 and 250 dollars. These cards can be reloaded at all of our locations. Larger denominations available, please call 716-626-9613. Purchase a Gift Card and you will be automatically signed up to start earning reward points. Gift card must be purchased in a minimum of ten dollar increments. Present your card when purchasing tickets or concessions. Earn 1 point for every dollar you spend at the box office or concession stand. Start earning FREE concession items or movie tickets for every 50 points earned. To inquire about your point balance, simply ask the attendant at the participating theatre, all they have to do is swipe your card. 150 Points = 1 free admission *not valid for "no-pass" engagements or special events. 300 Points = 1 free admission *not valid for "no-pass" engagements or special events. 450 Points = 1 free admission *not valid for "no-pass" engagements or special events. 500 Points = SPECIAL BONUS!!! 1 free small popcorn AND 1 free small soda fountain drink AND 1 free admission *not valid for "no-pass" engagements or special events. Cards are available only at participating Dipson Theatre locations. To earn points, the card must be presented at time of purchase. Members will receive 1 point for each dollar spent on ticket and concession purchases. Points are not awarded for purchases of gift certificates or bulk tickets, points are awarded when they are redeemed. Purchases are rounded down to the nearest whole dollar for calculation of points earned. Receive rewards for each 50 points earned. See reward schedule for details. There is a maximum of 40 points per card, per day. Points have no monetary value and may only be used for rewards as specified under the Terms and Conditions. Rewards members are awarded one point per dollar spent for tickets purchased online at dipsontheatres.com,Fandango.com and MovieTickets.com. Reward card must be presented at the time of ticket redemption at the box offce. The free movie pass is not valid for "no-pass" engagements. The free movie pass is valid for 3D movies BUT you must pay the appropriate up charge in effect. Free drink and popcorn coupons are for small sizes. Cards and points are non-transferable or combinable. Open to all customers 12 years of age or older. Except Dipson Theatre employees and their immediate family members. Any other exclusions will be based on the judgment of Dipson Theatres Inc. Program may be altered or discontinued at anytime without notice. If program is canceled unused points will have no value.